Отличные новости! Сегодня же установлю, не сомневаюсь - этот эддон заменит аналогичные на моих аккаунтах! Сразу вопрос: не стоит ли маркировать дополнительно чекбоксы на панели фильтрации? дабы была понятна принадлежность к плагину. Префиксом "МП:" или цветом первой буквы, например. Полезно будет при переходе, для сравнения функционала. Ну и дополнительная группа пинов напрашивается - гробницы Морровинда (на титул Библиотекарь). Last edited by lokicoon : 12/25/17 at 04:34 AM. Гробницы оно конечно было бы клево... Помню долго искал их когда то, но учитывая что делается это всего один раз то загуглить их местоположение совсем не проблема. Кроме того не хочется делать второй Дестинейшенс. Поэтому никаких пинов на ачивки делать намеренно не стану чтоб аддон остался таким же быстрым. В планах только сделать карты сокровищ и сундуки. 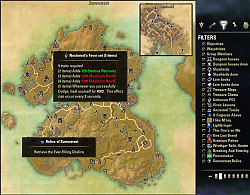 It would be nice to also show LoreBooks in Morrowind and Clockwork City. 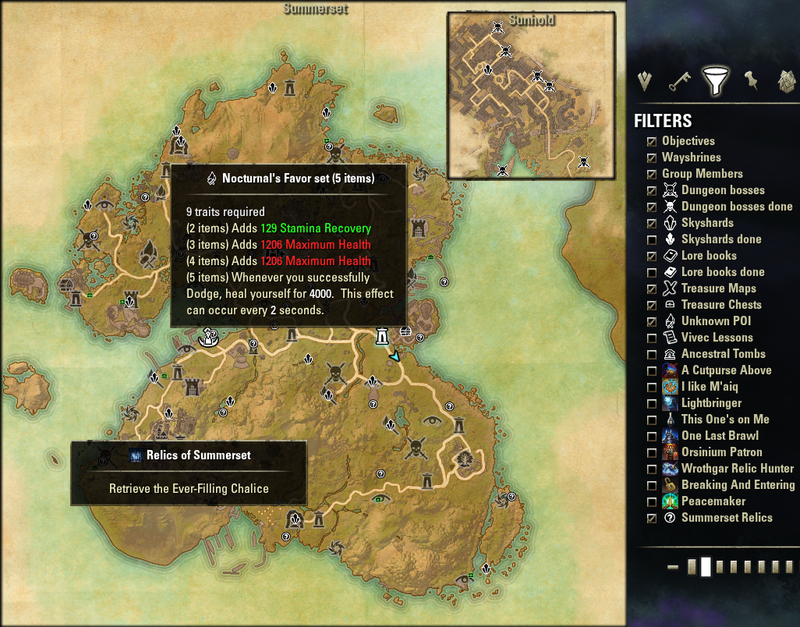 Just Lessons in Morrowind. But it is for achivement. Is it possible to change the color if skyshard is looted or already read a book? Why do you just redefine exisiting, well running addons and even use sometimes their data without any reference to the original authors and data miners, just to get your own addon doing the same? I'm not getting the point and imo it's quite unfair! Or did you really datamine all the skyshards, bosses and other places by yourself? You should at least credit the original data miners and authors in your addon description AND check if the addons are under a general/public license. You need to use the same or get their rules and follow them. This is. Open map filters. You right! Now a link to the source is added. No. This add-on uses different principles of work. And it is not a copy of some other add-on. You can check the code. Main function is PinTypeAddCallback. >just to get your own addon doing the same? It is true. This add-on does the same as others. But. It is much smaller and faster. I did this for myself and shared with other players. >Or did you really datamine all the skyshards, bosses and other places by yourself? Of course not all. 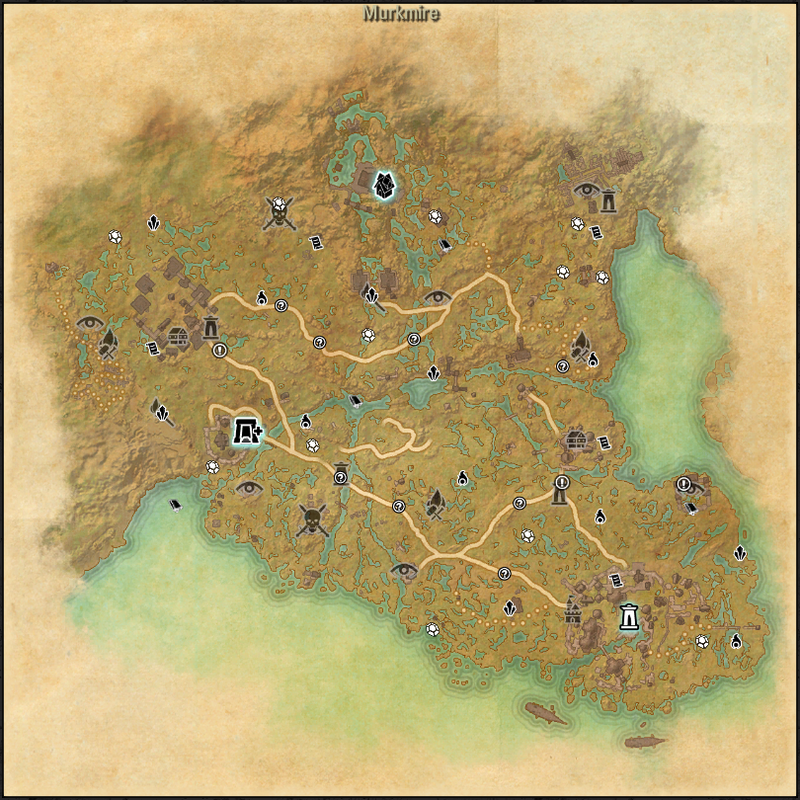 Most of the coordinates are taken from esohead map. Part of the data taken from game by add-on (you can see dataexport templates at the end of MapPins.lua file). Some data was collected by using EsoExtractData by Uesp (it is awesome!). And finally add-on have slash commands, that was used by me and some of my guildmates to adjust existing and collect new data (this add-on have developer page in our forum). 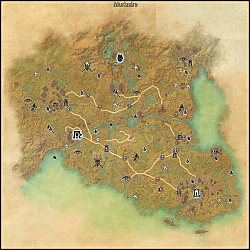 In the plans to use coordinates collected by me and guildmates by using Chestmaster9000 add-on to add all known chests on map. 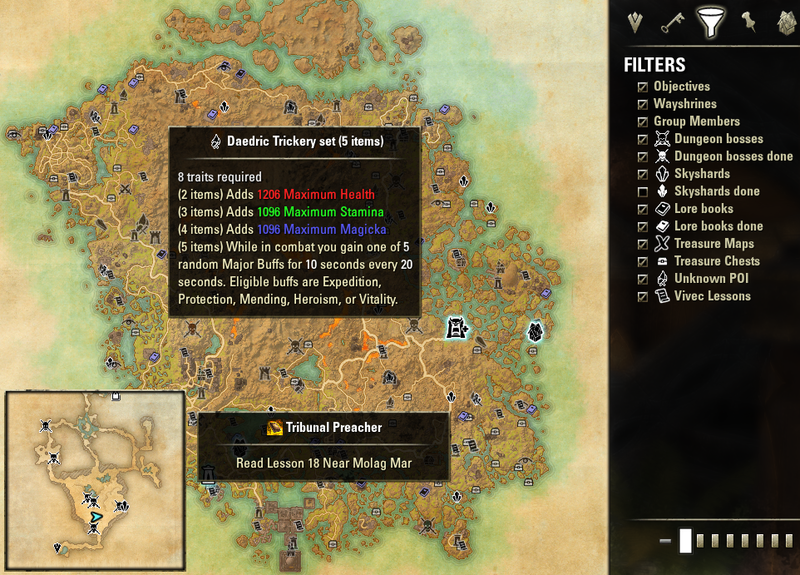 Haven't looked in the Mapfilters. Thx. Great work! Dont mind the criticism! 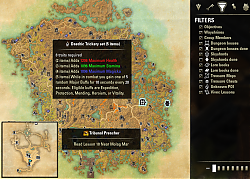 This addon shows the location of bosses in group dungeons? This is the one and only functionality that I miss from similar addons. hurts me too. many times this morning. It's no criticism but laws (if you don't respect other ppl's work and if they used a license that other authors should read, understand and use too). You can get to jail in some countries if you don't quote your source. It's stealing then. There are several addons out here that do the same, so it's up to him. And I respect his work! Learning by coding the addons is a good way to do it. So don't get me wrong, just respect the laws and common proceeding please. Thanks for the add on, appreciate your work! MapPins.lua:6870 is fixed. Sorry for this.